Whether you are just beginning a food storage program or have been working at it for years, you probably need help hiding it while still having access. If you don’t have this problem, is it because you aren’t using your storage? If that is the case, stop it and begin using your storage now! Create a table by stacking two 5-gallon plastic buckets, placing a wooden table round from the hardware store on top, and drape the whole thing with a fabric skirt. For a little different spin, use a new plastic garbage can, fill with food and cover with a wooden round and to the floor tablecloth. Purchase a bookshelf or storage shelf and hang a curtain to cover your stored items. Move the sofa out from the wall and stack food storage in boxes behind the sofa. Cover with a board and cloth. Instead of a brick and board bookshelf, use #10 cans to create that shelf. If they’re full of food, they’ll serve a double purpose. Most of you have heard those ideas, and most of them do not sound very appealing, so we will move on to some more creative concepts. We all know the value of under-bed storage. You can purchase risers for your bed, thus adding increased height for taller items as well as easier access. Higher beds are a popular decorating trend! Purchase under-bed storage boxes. Visit a shipping store to peruse the various sizes of shipping cartons available to fit your space. Wooden drawers from an old dresser or bins with rollers would be ideal for easy access. The cost of store-bought solutions can be shocking, so watch for sales, or innovate with what you already have on hand. If you have a deep closet with a bar for hanging clothes, move the bar as far forward as possible. Make sure you still have room to hang clothing. Add shelving to the back wall of the closet. Even if the shelf is narrow it can be used for smaller items such as soup cans, catsup, or shampoo bottles. Add an additional shelf. Most closets have a shelf above the bar on which you hang your clothes. Look for wasted space above that shelf. Add another shelf if you can, and take advantage of the space all the way to the ceiling. Remember you don’t have to use this for food storage but it is a great place for Christmas decorations and items you use only occasionally, freeing up other space. In children’s rooms, lower the clothing bar and add shelving above. Most clothing bars are hung higher than they need to be, even for adults, creating wasted space on the floor — which usually collects lots of clutter. Raise the floor. If you don't want to lower the clothing bar build a platform on the floor. Place storage boxes, number 10 cans, or other cans under the shelf and you will still have room for all those shoes on top of the shelf. Don’t forget the back of a closet door. An over-the-door shoe bag makes a great place to store spices, packaged seasonings, and other small items. The other big advantage is that you can see all your items, many of which get lost in drawers. The back wall is also a great place to hang shoe bags or a vertical can rotator. Canvas shelving that hangs from the dowel. Some of these units contain a drawer, which is perfect for all those lightweight items such as Q-tips and tissues. Add a second rod. Raise the upper rod a few inches and add one at waist height. You now have room to hang some of those clothes currently kept in drawers freeing them for storage of food and other necessities. Most people wear only 20% of the clothing in their closets. Try going through your wardrobe and if you haven't worn something in the last year get rid of it. All those things you are hanging onto for when you get in shape...donate them. When you lose that weight you will have earned a new wardrobe. Once you have decluttered your closet there will be room for storage container that you can use to store food. If you have enclosed space under your stairs, it could be a huge cavern just waiting to be put to work. Create access to the space within by creating an opening for a door and store away! Utilize an open staircase by installing custom cabinets, shelves, or storage cubes on the wall. For a decorative look add a bench with storage inside. If you don’t care about fashion or don't have the money to make changes, just stack away. This is a great place to stack and store lots of goods. If you are stacking keep a map of your inventory and remember to rotate your foodstuffs. Hang a curtain to hide your stored items. If you remodel, or know someone who is doing so, salvage the kitchen cupboards and add them to your garage. Remember you can mount them high and go all the way to the ceiling with storage while retaining plenty of floor space for the car. Old doors can be hinged together creating a screen to hide food behind. I know someone who did this with French doors and added simple, inexpensive blinds to the back. It looked great and hid her treadmill. Instead of a dresser, use an armoire. An armoire will double your storage space but without taking extra floor space. Add shelves and fold clothing on the shelves. Add baskets for small items. You probably don’t really want green beans stored in with your clothing, so why not move the sheets and other bedding into the bedrooms and empty the linen closet for food storage. Remember to look up … Baskets, hat boxes, and other decorative storage containers can also be added to the top of the armoire for even more storage, and can be decorative as well. Have a big bathroom? Add a dresser and store your supply of toothpaste, hygiene items and other bathroom products where these items are ready to use. Add storage above the toilet. You can purchase a ready made shelving unit or create your own. Try hanging square wicker or wire baskets with the openings facing out. Roll towels and store them here instead of in a cupboard. Now the cupboard is free for food storage. Use a smaller basket or closed container to store smaller items. Place these in the baskets you have hung on the wall. Pull the towels out of the cupboard and place them in a basket on the floor or store them under a bed. They are easier to pull out from under a bed then canned goods would be. Do you have a lot of wasted space in your cupboards? If you are stacking cans in the cupboard you can easily add another shelf. Adjust shelving to accommodate the size cans you wish to store on them. Leave about 1 ½ inches above the can so you are able to easily access your stored food. Pre-laminated shelving is ideal — it is easy to clean, and there is no need for shelf liners. Home centers will cut the boards for you so take exact measurements with you. If your shelving has the plastic supports, this would be a good time to replace them with the stronger metal ones. If you have cupboards without the pre-drilled holes for shelving, you will need to get some 1"x2" boards and add supports for each shelf. Hang a shelf on the walls a foot or two from the ceiling. In your bedrooms baskets can be placed on the shelves and used for food storage. In a family room or office books can be placed on the shelves freeing space in the cupboards for food storage. A shelf over a doorway can also add a great architectural touch to a room. Home improvement store have lots of decorative brackets at every price point. If you have a sofa in the middle of a room, consider adding a dresser or cabinet behind it that can be used as lamp table. This is a great place to store games, DVDs, or anything else that is taking up space in a cupboard that might best be used for food storage. Check under your sofas. Some are high enough to slip a case of veggies under or at least a low box with seasoning packets, toothpaste or other small items. Baskets, baskets everywhere! Store TP in a tall, tiered sewing basket in the corner of a guest bathroom, it's decorative and holds about 15 rolls. Sheet music can be stored in a picnic basket next to the piano. Baby bottles and bibs may be stored in a basket that decorates a kitchen hutch. A basket on top of the refrigerator is perfect for storing light items such as paper plates and napkins. Use a large basket for a side table. Fill it with food, Place a decorative fabric or burlap inside to hide the food and top with a glass round from the home improvement store. Stack blankets and quilts in a large basket next to the sofa. They will be easy to access on cold nights while readoing or watching TV and will, again, free cupboard space for food storage. Cover boxes with burlap and decorate with fabric or burlap bows or flowers and use on shelves as you would baskets. 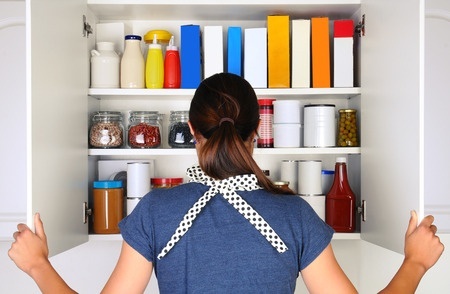 Do you have a lot of open space in your cupboards? Add more shelves. This is such an easy fix. If you are stacking cans in the cupboard you can easily add another shelf. Adjust shelving to accommodate the size cans you wish to store on them. Leave about 1 ½ inches above the can so you are able to easily access your stored food. Pre-laminated shelving is ideal — it is easy to clean, and there is no need for shelf liners. Home centers will cut the boards for you so take exact measurements with you. If your shelving has the plastic supports, this would be a good time to replace them with the stronger metal ones. If you have cupboards without the pre-drilled holes for shelving, you will need to get some 1x1s and add supports for each shelf. Clear items out of cupboards and off closet shelves and use these areas to store food. Roll towels and place them in a wine rack hung on the wall. Our hutch came with two built-in wine racks. What are we going to do with that? Roll place mats and place them in one and remove the other and add a basket to hide small items like cookie cutters. Now you can use the cookie cutter drawer for pudding and gelatins. Remove pots and pans from cupboards and hang them. All the decorative wrought iron curtain rods on the market now make an easy way to create a custom looking pot rack; just add hooks. Add a medicine cabinet. There are beautiful ones, which are flush to the wall and look like a mirror. Add shelves and use recessed shelving for spice storage. Add dowels between stubs to hang tablecloths. Enclose with cabinet doors. Invest in uniform storage containers. Having containers of the same size, for everything from linens to cereal, will greatly increase the amount you can store in a given space. Instead of a coffee table use an old trunk. Cover with a piece of glass for a smooth surface, make a cushion for a comfy foot rest, or leave as it. To make a simple cushion purchase an inexpensive sheet of wood product and cover with a foam pad or batting. Stretch fabric over the top and staple fabric to the bottom of the board while stretching it tight. Don’t forget the attic. Of course you would never store food in these hot spaces, but they are great for dry goods and other items unaffected by the heat. Use two purchased bookcases to flank either side of a window. Add a bench or cabinets on the floor between the bookcases. Lay a board on the top of the bookcases, long enough to span both cases and the opening between. Add molding to the front edge of the board. Paint the whole unit the same color and enjoy your added space for storage. If you don’t have a window wall, use the same purchased bookcases and create a storage space as if you had a window. Add a board instead of a bench and you have a great desk. Make or purchase a loft bed even if you do not have more than one child in a room. Even when I was in college we all fought over the top bunk. Move an additional dresser or shelving, under the loft and clear out room in the closet for food storage. You can often purchase bunk beds inexpensively at garage sales. It is a simple task to convert to a loft. OR place a sheet of plywood on the top bunk and store there. Hang a curtain from the ceiling and create a fort or castle look under the loft while hiding the stored items. There is often more room next to your bed than your side table takes up. Consider getting a larger bedside unit, a small dresser, a trunk, a small bookcase. Many things will work as wonderful, attractive bed side tables and make great storage areas for TP, lotions, toothpaste and other non food items. We have a friend who had a large living room. That is the room most of us only use when company comes. A wall was added to the end of the room creating a nice long "closet," which added extra storage space for food storage. The door is at one end of the wall making it look as though there is a small closet, but through that unassuming door is a cool, dark, large space for food storage that extends the entire length of the room. If you have a room that is larger than you really need borrowing just three feet from that room will create lots of storage. If you are renting, use a curtain suspended from the ceiling to create the "room." Right now a wall of fabric is a custom design statement. Consider the ceilings in the garage. You can hang shelving or items themselves, bikes, sleeping bags, sport equipment, holiday decorations, all kinds of heat resistant items will store well in a garage or attic, so look up. Remember preparing is not only about food. A garage or hot area is a great place for charcoal, water, camping equipment, paper goods and more. If you have attic space above the garage, install a pull down staircase and use this area to store items other than food. If you have open rafters, build some platforms and suspend them from the ceiling using 2x4s to support them. If your kitchen is off the garage, why not store your appliances on shelves next to the door into the house. Now you have freed-up cupboard space for food that cannot be stored in the garage due to heat and cold. If you have a boat or RV store items inside when they are not in use, which is, let's face it, most of the time. Do you have family near by who could store some things for you like your Christmas decorations or old papers you need to hang on to? For someone with an attic this would not be a big sacrifice. There is often room next to the washer and dryer. Purchase or build a narrow shelving unit that you can slide in and out. On the top shelf place items currently in use and on the other shelves store back-up cleaning supplies. Attach hooks for hanging coats and umbrellas near the front or back door. Build a v-shaped bench for boots and shoes and add a shelf higher on the wall for other items, allowing you to use a coat closet for other uses. Replace the chairs on at least one side of your kitchen table with a bench that has a storage compartment. Convert a closet to an office and use the office as your General Store. Store out of season clothing, blankets and even linens in your luggage. You may even consider storing your TP and tissue supplies in them. When you leave on a vacation just dump them on the bed and replace them when you return. Turn wooden magazine holders on their side, securing the bottom to the wall. Top with a wooden board and you have a shelf. Place cookbooks in the magazine holder and storage items in baskets or boxes on the shelf. Hang crown molding attached to a 1x4 in a closet and you will have instant storage for your shoes. Crown molding comes out from the wall at an angle, making it the perfect place to hang high-heeled shoes. Now you can move your shoes to a closet wall and use the floor space for food. Fold back carpeting and remove subflooring to expose joists. Build a box between the joists and store foods, cash or valuables. If you need to replace flooring use carpet squares, which makes getting to your stash very easy, or use the corner of the room where furniture can be placed over the carpet to hold it in place. This is especially good for those living in apartments and worried about rioting and hiding valuables. Attach spice racks to the back of bathroom cabinet doors for storing toothpaste, lotions, deodorant, over- the-counter medications, prescriptions, and other small items. In the kitchen, the same idea will provide a space for spices and vitamins. Build or purchase a simple coffee table with straight legs. Add cubes beneath the table that is cushioned and can be used for additional seating. Be sure they have a hinged lid and store inside. Hang netting from the ceiling to store stuffed animals, balls and other lightweight toys. Purchase or build a box with hinged lid. Create a padded seat and store charcoal, your Dutch oven or even a small tent inside. Purchase a unit designed with cubbies to hold baskets. Add a glass top and fill baskets with food storage. To create a dining table, purchase two units and place them back to back and top with a glass top. A linen closet does not have to contain linens and a coat closet doesn’t need to house coats. Now that you have created room for that food storage, there is one last thing to prepare. Create a list of the places you have designated for food storage areas and a master list of the items to be stored in each area. After all this work, you want to be able to find your ingredients as you prepare your family feasts. Get busy and get organizing and stocking up! If you have questions about what non-food items you should be storing now is the time to get some answers. Visit Carolyn’s facebook page each Monday for help.